Birthplace of Napoleon Bonaparte and home to some awe-inspiring natural landscapes, Southern Corsica (or Corse-du-Sud) entices with outdoor pursuits, remnants of prehistoric settlements, and a stunningly diverse scenery. From the dramatic white cliffs of Bonifacio, to whimsical rock formations of Piana, to the uninhabited Lavezzi Islands and white-sand beaches, Southern Corsica has plenty to capture imaginations with. Opening hours: Although business hours may vary, there is often a lunch break at most shops and small businesses, making the customary working hours from 8.30 or 9am to 1 or 1.30pm & 2 or 2.30 to 6 or 7pm. Most businesses close on Sundays. 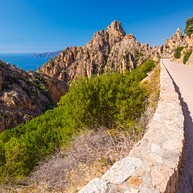 From steep cliffs of Bonifacio, to the majestic landscapes of the island's interior, to white-sand beaches and uninhabited islands just off the coast, to yellow and orange tones of Ajaccio (the capital), Southern Corsica is a region of spectacular natural beauty and a great many outdoor pursuits. No paths or roads lead to the Scandola Nature Reserve, an area of wild natural beauty accessible solely by sea. This UNESCO World Heritage Site is all cliffs and sensational rock formations, pristine waters, and dramatic sea- and landscapes. One company offering boat tours is Porto-based Via Mare, at the Hôtel Le Golfe (+33 6 07 28 72 72; www.viamare-promenades.com). One of the island's UNESCO World Heritage Sites, the wondrous cliffs of Piana are best seen in the evening, when the natural reds of the earth light up in in the rays of the setting sun. 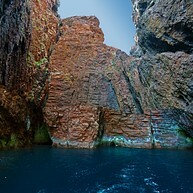 Another way to see the cliffs is from the water, on a boat cruise in the Gulf of Porto. Just south of Porto-Vecchio lies Corsica's celebrated Plage de Palombaggia, an idyllic beach with crispy white sand and azure waters. 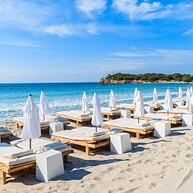 There are several locations that provide sunbed and umbrella rentals, along with a couple of beach restaurants along the stretch. 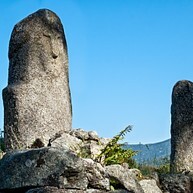 The megalithic archaeological site of Filitosa is known for its curious menhirs, with detail of facial features and body outlines carved into them. Earliest artefacts dug up here date back to 3300 BC (the menhirs are estimated to have been erected around 1500 BC). There are a small museum and a thousand-year-old olive tree on site. The capital of Corsica and birthplace of Napoléon Bonaparte, Ajaccio is an attractive seaside settlement with an animated yet slow-paced street life. Some of its primary attractions include the Maison Bonaparte (the Bonaparte family's ancestral home) and the fine arts museums Musée Fesch, containing works of great masters such as Titian and Botticelli. The uninhabited Lavezzi islands off the coast of Corsica are one of its must-visit natural gems, located a short boat ride from Bonifacio or Porto-Vecchio. Nature is pristine and water crystal-clear, which makes for some fantastic snorkelling. Bring your own sun umbrella and plenty of water (facilities are minimal). The island's oldest citadel sits dramatically atop a high-rise rock platform in Bonifacio, the Corsican town a mere 12 kilometres away from Italian Sardinia. It is a definitive must-visit that reads more like a place somewhere in southern Italy than a French one, and radiates a leisurely, uncomplicated air. 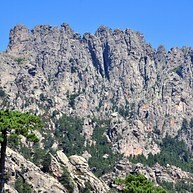 To see some of the island's most striking natural landscapes, follow the Col de Bavella, a mountain pass that affords spectacular views of the Aiguilles de Bavella (the Bavella "needles", called that for its spiry peaks). A part of the G20 trail runs from the Notre Dame des Neiges statue all the way up to the massif. Sartène, a scenic town historically notorious for its banditry and rivalling gangs, has long-left the grim of its past behind, while preserving the historic tradition of re-enacting Jesus' way to the Calvary on Good Friday every year. 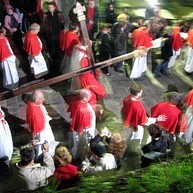 The 35-kilo cross and 17-kilo chain used in the reenactment are displayed at the Sartène church of St.Mary.